Source: University of Virginia, Miller Center of Public Affairs, www.millercenter.virginia.edu, November 14, 2007. Born: March 16, 1751, Port Conway, Virginia. Nickname: "Father of the Constitution"
President: Two terms (eight years) from 1809-1817. Died: June 28, 1836, Montpelier, Orange County, Virginia. Source: www.WhiteHouse.gov, November 15, 2007. A student of both history and law, James Madison attended the College of New Jersey (later known as Princeton University), returning to his native Virginia to help craft that state's Constitution, as well as serving as a leader in the Virginia Assembly. Following the American Revolution, Madison was instrumental in determining the course of the new Republic and in framing the government of the new Nation. With Alexander Hamilton and John Jay, Madison wrote The Federalist Papers, a series of 85 essays that advocated the adoption of the United States Constitution. 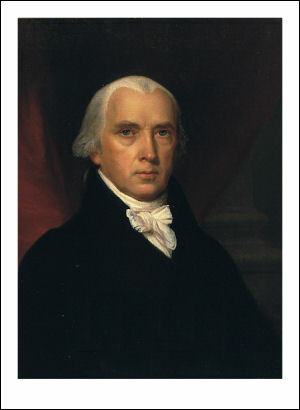 In Congress, James Madison helped secure passage for the Bill of Rights. France and Great Britain were at war when James Madison was elected to the presidency. Though he favored a more neutral position, the continued harassment of American sailors, combined with the seizure of American cargo, forced President Madison to ask Congress for a declaration of war with Great Britain on June 1, 1812. Act of December 2, 1812: This Act directs the location of the United States Mint to remain in Philadelphia for another term of five years, beginning March 4, 1813. Act of April 29, 1816: This Act authorizes certain gold and silver coinage from foreign countries as current and legal tender for the payment of all debts within the United States. Specific rates of exchange are enumerated for the coins of England, Spain, Portugal and France. The Act also calls for an annual assay of such coins made current by the Act, and for a report to the Congress detailing the results. 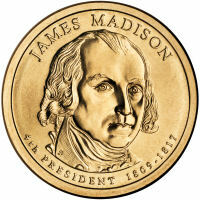 President James Madison did not appoint a Director of the United States Mint. Source: www.USMint.gov, November 14, 2007. Madison's Treasures (Library of Congress Exhibition) The documents presented here are among the most significant Madison holographs in the Library of Congress' James Madison collection, the largest single collection of original Madison documents in existence. The James Madison Papers, 1723 - 1836 (American Memory for the Library of Congress) The James Madison Papers from the Manuscript Division at the Library of Congress document the life of the man who came to be known as the "Father of the Constitution" through correspondence, personal notes, drafts of letters and legislation, an autobiography, legal and financial documents, and miscellaneous manuscripts. James Madison (1801-1809) American President: An Online Reference Resource from the Miller Center of Public Affairs, University of Virginia. In-depth information reviewed by prominent scholars on each President and administration. James Madison Companion site for Public Broadcasting's American Experience: The Presidents . James Madison James Madison from Wikipedia, the free encyclopedia. James Madison: Fourth President The American Presidency: A Glorious Burden : Objects from the Presidency from the Smithsonian National Museum of American History, Behring Center. James Madison's Montpelier Montpelier, nestled in the foothills of the Blue Ridge Mountains, was the lifelong home of James Madison. Madison was raised at Montpelier, lived here after his marriage to Dolley, returned here after his presidency, and died here in his study surrounded by the books and papers that marked so much of his life's work. It was at Montpelier where Madison researched past democracies and conceived of the system of government that became our republic. The Fourth President: A Life of James Madison , by Irving Brant, Hardcover, Publisher: The Bobbs-Merrill Company (1970). One volume James Madison biography by the author of the six volume definitive (and scarce) biography of the fourth president. James Madison: A Biography , by Ralph Ketcham, Hardcover, Publisher: American Political Biography Press (March 2003). Drawing upon the immense amount of original source material that has become available during the past thirty years, Ralph Ketcham has written a complete, thoroughly researched, and enlightening study of the life of the father of the Constitution and fourth President of the United States. James Madison: The Founding Father , by Robert Allen Rutland, Paperback: 287 pages, Publisher: University of Missouri Press (September 1997). A portrait of the man who essentially fathered our constitutional guarantees of civil and religious liberty. 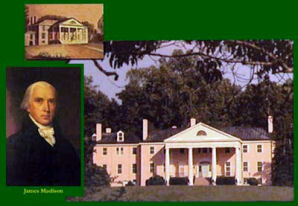 Focusing on the role Madison played at the Continental Congress and in each stage of the formation of the American Republic, Robert Allen Rutland also covers Madison's relationship with his beloved wife, Dolley, his fifty-year friendship with Thomas Jefferson, and his years as a respected elder statesman after serving as secretary of state and fourth president of the United States. The Business of May Next: James Madison and the Founding , by William Lee Miller, Paperback: 312 pages, Publisher: University of Virginia Press (January 1994). Madison is depicted during the critical years between 1784 and 1791, when he was so active in articulating the governmental aims of the fledgling nation that he sometimes found himself in official dialogue with himself. James Madison: (The American Presidents Series) , by Garry Wills, Hardcover: 208 pages, Publisher: Times Books; 1st ed edition (April 2, 2002). In this work, one of the first in a new series being published under the general editorship of Arthur Schlesinger, Pulitzer Prize-winning historian Wills does not attempt to offer a complete biography of Madison. Rather, he sets out to solve a mystery: how could Madison have been such a spectacularly important Founding Father and later just a slightly above average President? Written with flair, this clear and balanced account is based on a sure handling of the material. It should appeal to general readers as well as specialists. The Presidency of James Madison , by Robert Allen Rutland, Hardcover: 240 pages, Publisher: University Press of Kansas (April 1990). This narrative covers all major events of the Madison administration, including the War of 1812 and the push for national expansion. It provides a fresh interpretation not only of the contribution of Madison's presidency, but also of the "master builder of the Constitution" himself. Mr. Madison's War: Politics, Diplomacy and Warfare in the Early American Republic, 1783-1830 , by J.C.A. Stagg, Paperback: 560 pages, Publisher: Princeton Univ Pr (September 1983). In Mr. Madison's War , Stagg's purpose is to "develop a detailed study of what the Madison administration intended to happen in the War of 1812, of how it translated this intention into specific policies as they were carried out." The Last of the Fathers: James Madison and the Republican Legacy , by Drew R. McCoy, Paperback: 406 pages, Publisher: Cambridge University Press (June 28, 1991). McCoy's detailed work picks up where others leave off, at Madison's retirement in 1817. The focus is on Madison (1751-1836), the exponent of an 18th-century "republican faith" and his "persistent effort to comprehend--and influence--the fate of the Revolutionary vision as he encountered both its failures and the shocks of the new era. Founding Brothers: The Revolutionary Generation , by Joseph J. Ellis, Hardcover: 304 pages, Publisher: Knopf; 1st edition (October 17, 2000). National Book Award-winner, Joseph Ellis focuses on six crucial moments in the life of the new nation, including a secret dinner at which the seat of the nation's capital was determined--in exchange for support of Hamilton's financial plan; Washington's precedent-setting Farewell Address; and the Hamilton and Burr duel. Most interesting, perhaps, is the debate (still dividing scholars today) over the meaning of the Revolution. Strength And Honor: The Life Of Dolley Madison , by Richard N. Cote, Hardcover: 444 pages, Publisher: Corinthian Books (January 7, 2005). Based on more than 2,000 letters, this portrait of Dolley Madison is buttressed by a wealth of primary sources. According to the author, the "best-loved first lady of the nineteenth century" was respected for her intelligence, wit, and interpersonal skills. A Perfect Union: Dolley Madison and the Creation of the American Nation , by Catherine Allgor, Paperback: 512 pages, Publisher: Holt Paperbacks (February 20, 2007). Allgor's sympathetic biography argues that, as the architect of Washington's social scene, Dolley gave the new republic the forum it needed for the development of an indigenous political culture. More James Madison Books from Amazon.com.